Wow…I have been blessed with some amazing PR recently. First my home was featured in the fab French magazine MILK (you can read the article in English here) and it was also featured in Dutch magazine 101 Woonideen, I got interviewed by The Scotland Mail on Sunday and yesterday I answered an interview for ELLE DECORATION (Elle Deco!! I mean this has been on my wish list since the day I started BODIE and FOU!!). 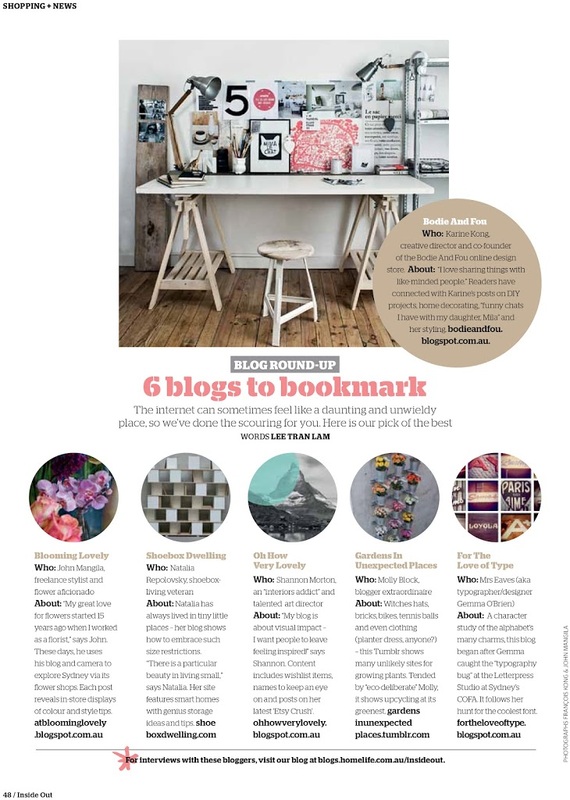 To top it up, this morning I received a PDF from Inside Out magazine featuring my blog as one of 6 blogs to bookmarks and I’m in great company with Blooming Lovely, Shoe Box Dwelling, Oh How Very Lovely, Gardens in Unexpected Places and For The Love of Type. So big thank you to Lee who wrote the piece. I’ve already told her when she contacted me, that it made really happy because I genuinely love Inside Out and it is one magazine I always grab each time we go to New-Zealand to visit Steve’s family. If you live in Australia or New-Zealand, you know what I’m talking about…right!? WOW, contratulations! I recently found your Blog while reading Mrs Jones-Blog. Just visited your BODIEandFOU shop – beatiful. For now on I’ll by Inside Out – hope the Magazine could be found in Finland too. I have a Blog also – for all my own handmade recycling-handigrafts (unfortunately in Finnish – so far). Have a nice week.